Columbus are a single site operation with the major benefit of having all our technical and service departments here in Middelburg. 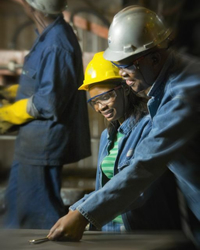 This enables us to offer exciting career opportunities for outstanding people in a range of areas, including metallurgy, engineering, information technology, production, human resources, logistics, national and international commercial and financial disciplines. Situated in Middelburg, employees enjoy country benefits - eco-tourism, fishing, hiking and living, while being close to the city. Graduates / diplomats (mechanical, electrical/electronics, control & instrumentation, industrial, metallurgical). Structured Engineer in Training Programmes accredited by ECSA. Bursaries are made available for exceptional candidates in the above disciplines. Bursary opportunities are advertised in local newspapers and at leading Universities in the country. We wanted to let you know about recent ‘phishing’ scams in which fraudsters try to extract personal information or money by pretending to be Columbus Stainless. They might be making false job offers, asking for money to participate in a recruitment process, or running a fake jobs lottery. How to spot a fraudulent email? It’s asking for money. We’d never do this. It’s asking for bank details before we’ve made you a job offer. We don’t do this either. It’s out of the blue: we only offer jobs following a formal application and selection process, including face-to-face interviews.